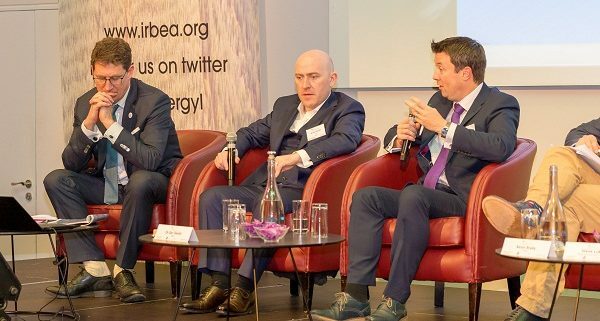 The mood at the National Bioenergy Conference – Bioenergy Future Ireland Conference was buoyant, IrBEA had an extremely enjoyable day at Croke Park, organisers made a decision to bring it to a new level this year, in excess of 300 attendees & 32 exhibitors attended the conference. It included consumer groups and technology provider of biomass and Bioenergy. Amongst the speakers were representatives from Diageo, Dairygold, ABP and CPL Industries which are all part of the potential consumers group of energy and are all active in this space – incorporating bioenergy technology and sustainability into their strategic plan and reducing their carbon footprint. Here we had real commercial activity in the sector represented – consumers who are already using the technology and sharing their experiences. Tomas Hubert from the Farmer’s Journal commented last week on the weekly podcast that he felt there was more energy in sector than previous years at the conference. We had companies who are less reliant on government schemes, he spoke with Ger Devlin (IrBEA CEO) who emphasised that there has been a lot of activity in last 12 months; we have put considerable work into trying to kick-start the industry in Ireland. One of our main objectives of the association is to lobby government and seek to influence policy makers and to promote the development of the sector and the interests of our members. Subsidies are still very relevant says Ger Devlin, SSRH is extremely important, people are more optimistic, they see more opportunities, what we need now is sustainable bioenergy growth for technology providers and suppliers. 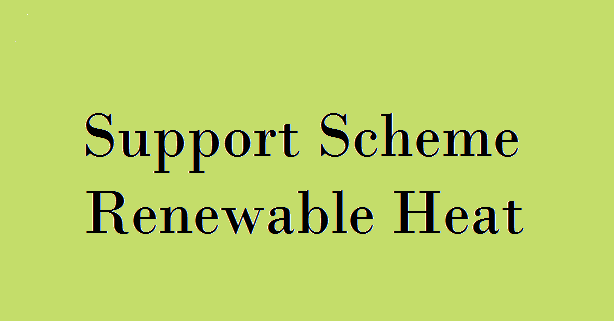 Implementation of the scheme is critical to boast the sector. Similarly we have the consultation on Biofuel Obligation Scheme (BOS) and the Renewable Electricity Support Scheme (RESS) coming down the track which will contribute to the decarbonising of our electricity and transport sector. 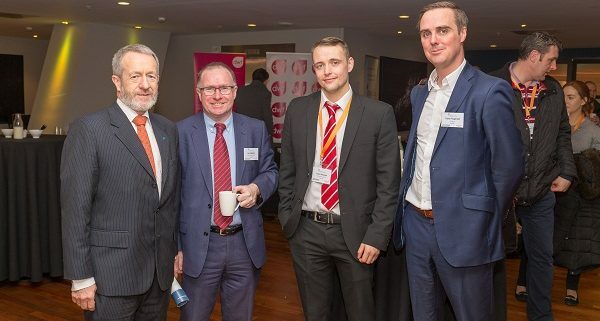 Kevin Brady a Principal Officer in DCCAE spoke at the conference and confirmed expected government support schemes for renewable heat and electricity in the coming 18 months saying they were progressing through the national and EU regulatory process. He added that the Government has committed €300m to fund the Support for Sustainable Renewable Heat Scheme (SSRH) over the next 10 years. The Government aims to open the scheme in the second half of this year after drafting detailed terms and conditions and obtaining EU state aid approval. The scheme will pay users of large boilers, such as hotels or pig farms, a subsidy to switch to renewable sources including biomass and is expected to increase demand for energy crops. Biogas from anaerobic digestion may receive support under the scheme later, either for use in combined heat and electricity generators as a separate renewable electricity scheme opens in 2019 or for injection into the national gas grid, Brady said. Tomas Hubert asked Ger Devlin is there a possibility to bring biogas from remote areas of rural Ireland into urban areas? Can we really anticipate small suppliers of biogas to supply to the grid? Ger Devlin says Gas Networks Ireland are big advocates of small producers of biogas, in fact the future is biogas to biomethane which can then be used for grid injection. This way you are targeting decarbonisation of transport and the heat sector, especially if the transport sector is moving towards compressed natural gas. AD also has a big role to play in decarbonising agricultural sector, GNI have a map which specifies where the best locations for injection into the grid will be located. Gas Networks Ireland (GNI) have announced at the conference that it would begin construction of its first injection point for biogas in Cush, Co Kildare, next week and intends to apply for planning permission for a second site in Mitchelstown, Co Cork, by the end of this year. “The vast majority of what we’re looking at is farm-based anaerobic digestion” to source biogas, said Ian Kilgallon of GNI. 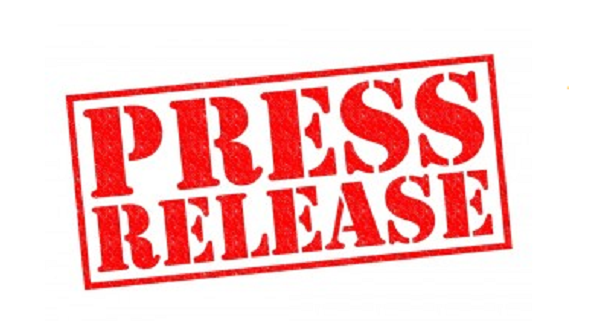 DCCAE did not implement a biomethane subsidy in the recent SSRH, but the department has sent out a call to the industry and have discussed possible solutions with stakeholders. Tom Hubert said we were definitely presented with companies at the conference from Ireland who were implementing bioenergy activity in other countries. EERL is sourcing biofuels in Hungary and ABP is developing their biofuel business in UK, Bord na Mona are looking to the USA to produce woodchip. Diageo are building biomass CHP in their distilleries in Scotland. Hubert asked Ger Devlin how do we get these companies to operate in Ireland? Ger said currently the tariffs are better abroad, the RHI and BOS have worked well in the UK and attracted businesses and we hope that with SSRH, BOS and the RESS we can attract some of that business back to Ireland. In terms of Bord Na Mona who made a presentation on the day there was a clear message of sustainability. They are currently importing woodchip and pellets from overseas, they are however committed to co-firing and they hope to use indigenous biomass supplies over time. They want to engage with landowners here at a local level but right now they still have to co-fire with current levels of supply which means they have a backup plan with import woodchip. 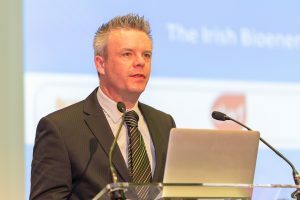 Patrick Madigan, head of Bord na Móna Bioenergy, was cautious however calling for full clarity around the upcoming Support for Sustainable Renewable Heat and for a separate grant scheme for farmers.”Farmers and landowners are struggling with the idea of investing in willow and energy crops,” Madigan said. Peter Moran from the pharma group AbbVie in Sligo was still frustrated at how long it is taking to get the SSRH scheme up and running, he commented that’s it very hard to build renewables into an energy proposal for a company when there has been so much delay in the implementation of the heat scheme. 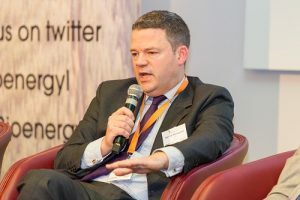 ABP Food Group’s sustainability manager John Durkan detailed the company’s involvement in renewable energy in the UK, including the recent redevelopment of its Ellesmere factory where animal fat and used cooking oil is collected by its subsidiary Olleco now produce all heat and 70% of electricity requirements. Dairygold head of sustainability Dave Fitzgerald said that his co-op was planning to increase the share of renewables in the gas supply it already uses to dry milk and produce electricity at its plants. “The existing gas infrastructure is where we see the future,” Fitzgerald said. “We’re looking at the opportunity of using gas in some of our trucks. It’s a more cost-effective solution” he added. 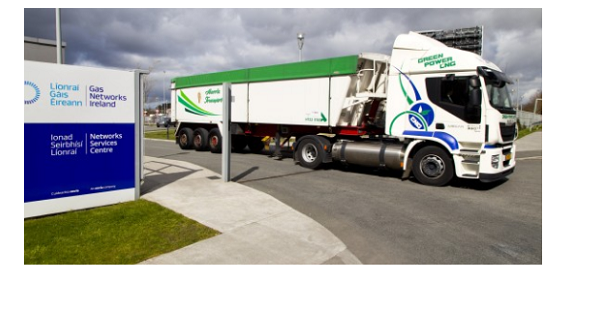 While Dairygold already produces biogas by processing waste from its Mitchelstown factory with an anaerobic digester, the co-op will need more waste and is planning to get it from local farms in the future. 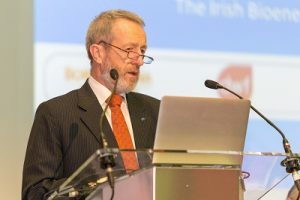 A participant to the conference told the Irish Farmers Journal that the event attracted more financiers and lawyers than previous years – a sign that the industry is becoming more attractive to investors. One of them was Garrett Monaghan, a partner in the Dublin-based law firm DWF which helps put together renewable energy projects. 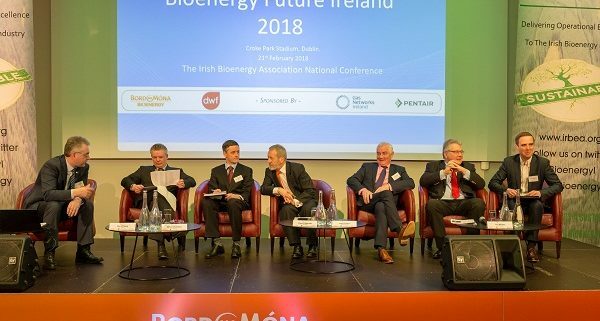 “Bioenergy, and specifically biogas, should play a greater role in Ireland’s electricity supply,” he said, highlighting the planned growth in population, economic activity and electrification of sectors such as transport. 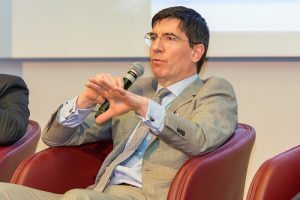 Monaghan cited data centres such as Google’s and Apple’s as large consumers of certified green electricity and said that direct power purchase agreements with such big private buyers would present opportunities until Government schemes were in place to support wider distribution of renewable energy. We hope everyone enjoyed the day and if anyone would like to look at the speaker presentations again Click here where you will be asked for a password which is “bioenergy18”. We will shortly be uploading videos of the speakers. Material from this article can found at the following links. Reacting to European Parliament’s vote on the Directive on the Promotion of the Use of Energy from Renewable Sources (RED II) yesterday, forest owners and managers welcome it as a positive step. The outcome recognises the importance of forests and their role in tackling climate change. In particular, forest owners and managers recognise the efforts made by MEPs to set up a suitable system to verify sustainable forest biomass sourcing (Art. 26). This was achieved by rejecting the devastating amendment on regulating the use of different types of biomass feedstocks. The “risk-based” approach, which was supported in the vote, takes into account existing legislation and tools on sustainable forest management. However, certain sustainability requirements still need to be refined and simplified. But forest owners and managers regret that MEPs wants to allow the Commission to remove feedstocks from Annex IX as this could have a negative impact on long-term biofuel investments. 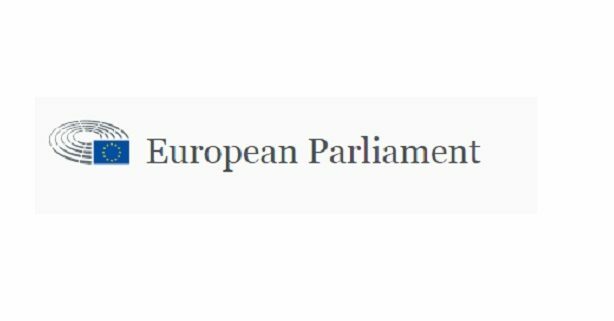 The three organisations also urge EU policy-makers to pay attention to the wording on waste hierarchy and market distortions as this could result in the introduction of the cascading use principle into legislation. It has been highlighted also by the Commission, that the principle is not fit for EU legislation and goes against market principles. According to the organisations mentioned earlier these formulations should consequently be removed during the next steps of the legislative process. The Biofuels Obligation Scheme was introduced in 2010 and requires suppliers of motor fuel to ensure that biofuels make up a certain percentage of national annual fuel sales. This is known as the biofuel obligation rate and is currently set at 8%. DCCAE want the public to know that the biofuel obligation rate has an important role to play in helping Ireland meet its 2020 renewable energy targets. Ireland is committed to ensuring that by 2020, 10% of the energy consumed in the transport sector will come from renewable energy sources. In order to meet this target, it will be necessary to increase the biofuels obligation rate to approximately 12%. 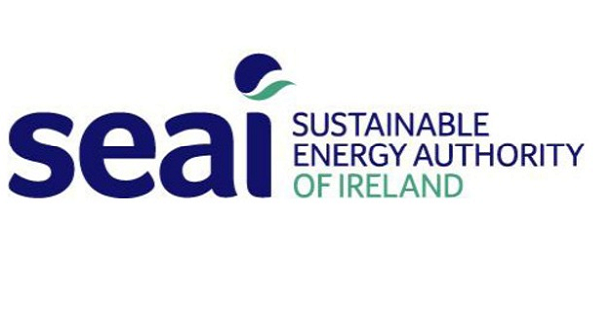 The Department of Communications, Climate Action and Environment is seeking views in relation to implementing a phased increase in the biofuel obligation rate and on how the scheme could be developed in the future. View the consultation document from DCCAE on future increases in the biofuels obligation rate here and details regarding public submissions on the website. Increasing the blend rate to 10% from 2019 to 12% from 2020? Introducing the BOS into the heating sector? IRBEA has spent some time drafting a response to the Commission for Regulation of Utilities (CRU) on pending Enduring Connection Policy Stage 1 (ECP-1) which has far-reaching consequences for connectivity of renewables. The submission can now be viewed IrBEA Response to CRU17309 Consultation_Final We would like to thank everybody who contributed to the final submission.